I know it hasn’t happened in some time. But, someday, the U.S. stock market will decline. The bears are making good arguments. From a fundamental perspective, the bears warn stocks are as overvalued as they were before market crashes in 2000 and 2008. I believe more gains lie ahead for U.S. stocks, but other global markets are also pointing up. One sector that’s undervalued is emerging markets. And technical analysis shows multiple buy signals. Emerging markets are breaking out of a multiyear downtrend. The chart below shows emerging markets could outperform the S&P 500 in the future. This is a chart of the relative strength of emerging markets to the S&P 500. When the line is rising, emerging markets are performing better. When it’s falling, the S&P 500 is the better investment. 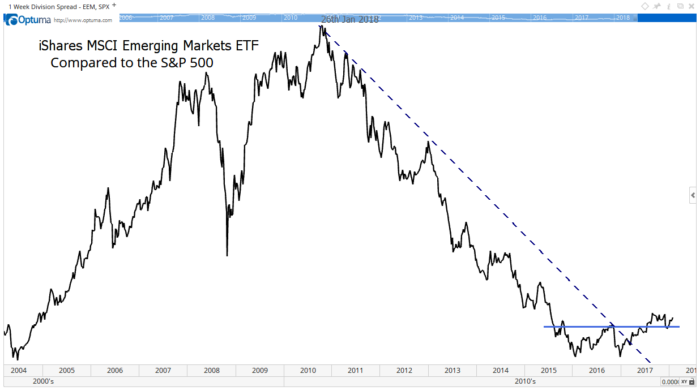 The dashed line highlights the downtrend in emerging market relative strength that began in 2010. Last year, we saw an upside break out in that line. However, that wasn’t a buy signal for conservative investors. The relative strength line still needed to reach a new high. It did that when it broke above the solid horizontal line. Now, relative strength fell and tested the resistance shown as the horizontal line. That’s bullish and sets up an extended rally. While it’s not time to sell U.S. stocks, it is time to buy emerging markets. There’s one more reason to buy emerging markets. Emerging markets trade with a Shiller cyclically adjusted price-to-earnings ratio, or CAPE, of 17.3, about half the level of U.S. stocks. Emerging countries in Europe are even cheaper, with a CAPE ratio of 9.2. Technicals and fundamentals are telling us to add exposure to emerging markets. There’s no direct trade on a basket of emerging European markets. But there is a trade on emerging markets around the world. The iShares MSCI Emerging Markets ETF (NYSE: EEM) is one way to do that. Call options on EEM are another way. Either trade should deliver gains whether U.S. stocks continue moving up or decline.